Simon & Schuster, 9781451655094, 256pp. In this funny, frank, and tender new memoir, the author of the New York Times bestseller A Homemade Life and the blog Orangette recounts how opening a pizza restaurant sparked the first crisis of her young marriage. In this funny, frank, tender memoir and New York Times bestseller, the author of A Homemade Life and the blog Orangette recounts how opening a restaurant sparked the first crisis of her young marriage. With evocative photos by Molly and twenty new recipes for the kind of simple, delicious food that chefs eat at home, Delancey is a moving and honest account of two young people learning to give in and let go in order to grow together. "Charming, funny, and honest--in a hip, understated way--Wizenberg combines simple, appealing recipes with a tale of how nurturing her husband's passion project helped her see him, and herself, more clearly." "The messy, explosive, and exhilarating story of giving birth to a restaurant...draws readers right into the heat of the kitchen." "What makes this story so readable...is that it doesn't just chronicle the nuts and bolts of starting a restaurant. It's as much about navigating a new marriage, figuring out what kind of life you want to make together and what roles you want to play in life together." "It's about how the things we make, make us. It's also about discovering our stories as we live them, learning to understand them, and ourselves through them. Oh, and it's about pizza too." "Illuminates the restaurant experience in a way that was entirely new to me....Molly's gift is to walk you through the process while simultaneously broadcasting her own emotional journey...honest and essential." "You will cheer for Wizenberg...and her husband as they navigate the exciting and sometimes treacherous task of opening a Seattle pizza shop--and try to build a marriage too, in this honest, sprightly memoir." "Charming . . . humorous, intimate, and honest." "Molly Wizenberg writes with the sweet candor of Laurie Colwin and the sly amusement of M.F.K. Fisher. Delancey is the perfect restaurant tale -- gripping, nutty, and yet somehow meant to be." "Delancey is so riveting, well-written, and interesting, I found myself wishing it were twice as long. Molly Wizenberg writes as well about life as she does about food. Her voice is so charming and funny and poignant, it made me want to invite myself over to her place for dinner, where I would certainly overstay. I loved this book." "You might think making pizza is a piece of cake (or pie!) But Molly Wizenberg’s tale of triumph as she and her husband learn to make the perfect pie, and construct the restaurant to serve it in, make for delicious – and dramatic – reading. Told with humility and humor, Delancey shows that with hard work and determination, dreams can come true . . . no matter what obstacles lie in your way." "Molly Wizenberg’s Delancey is so much more than a memoir about opening a highly regarded pizza restaurant. It is a story about building a marriage and a beloved community through grit, thrift, and self-determination in the pursuit of excellence. Ultimately this is a story about whole-heartedly embracing the one you love without trying to smooth away the rough edges or edit out the hard parts. It is also a most delicious read (with recipes!) that sent me to the kitchen as soon as I turned the final page." "Delancey is the extraordinary tale of what it means to build a life with the person you love, and the professional roller coaster ride that is opening and running a wildly successful restaurant together. 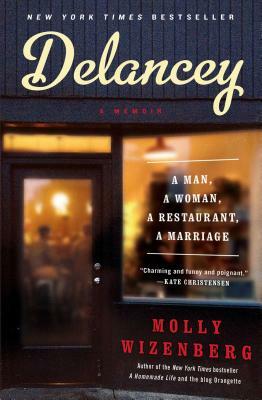 Molly Wizenberg has, in her inimitable way, written a modern love story that marries razor-edged wit to warmth, and passion to flavor; Delancey is an utterly delicious read."